Mike Carey won’t be officiating your NFL games this season. In the event you missed it, he retired from being a referee and has joined CBS Sports and the NFL Network for game and rules analysis. 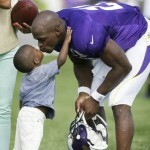 Son of Adrian Peterson beaten to death by mother’s boyfriend Adrian Peterson has lost his 2-year-old son under violent circumstances. Initial reports from TMZ revealed that the child had been taken to a Sioux Falls, South Dakota hospital after a 911 call was placed from the mother’s apartment. Deacon Jones, 74, dead of natural causes The NFL lost a legend when Hall of Fame defensive end, David “Deacon” Jones passed away.